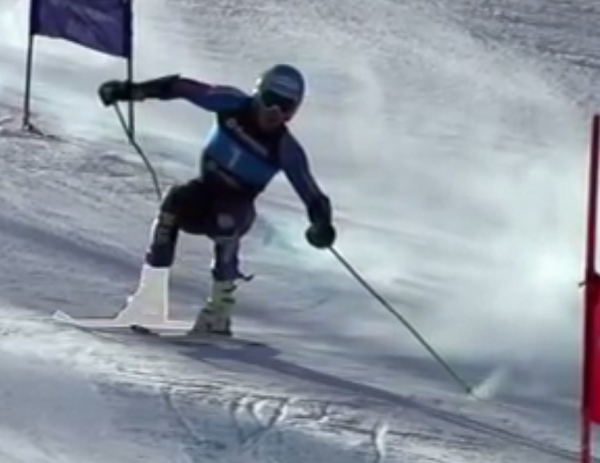 As you can see, the outside leg is lifted before the edge change, all weight (not much in reality) transferred to the other ski, which is still on the uphill edge. You can listen to Ted talk about moving onto his new outside ski while it is on the other set of edges and about the resulting quickness and smoothness of the transition, at about 1:57 into the video. I have a really fast transition, where [...] I'm starting my new turn on the other ski really quickly [...] before it's actually rolled from the uphill edge to the downhill edge. Because the body is suddenly leveraged against the "highest" edge, it will very quickly transition into the turn and establish early angles. This is a good way to quicken the transition. Transferring balance to the new ski early makes engaging the edge easier: the new outside ski is then simply rolled through flat onto the new edge, which will then engage and start carving into the new turn. This release it's in the Flexed release category as it combines flexing the outside ski with weighting the inside ski lightly, with the dominant being the flexing to release. This release has many benefits, especially in racing. The One ski skiing is great to refine the balance required for this transition. So are the Super Phantom++. Viewed 792 times ( | Print ) this page.